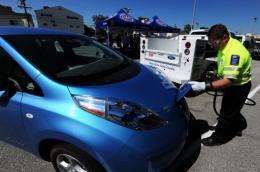 John Nielsen of the American Automobile Association (AAA) demonstrates charging a Nissan Leaf electric car in Los Angeles, California, August 2011. General Electric and Nissan, maker of the all-electric Nissan Leaf, said Friday they will team up over the next two years to explore ways to promote the use of electric vehicles. General Electric and Nissan, maker of the all-electric Nissan Leaf, said Friday they will team up over the next two years to explore ways to promote the use of electric vehicles. "We don't want to build cars," Mark Little, director of GE Global Research, said Friday. "However, GE can help Nissan make EVs easier to use and more consumer friendly... We want to get into this space in a big way." Little said that GE brings its considerable expertise in the world's power infrastructure to help address the global challenge of integrating millions of electric cars onto the grid. "As the US and world move toward electric vehicles, the automotive sector is forming new industry connections that extend well beyond the traditional (parts maker) space," he said. "One of the biggest connections being made is with companies that generate and provide electricity. "As a major provider of power generation equipment and energy services, GE is in a great position to help the automotive industry bring millions of electric vehicles onto the grid," Little said. Bob Sump, vice president of vehicle engineering for Nissan Americas, said GE's broad expertise with energy networks will help Nissan create better conditions in the market for cars like the Leaf. "Connections like this research partnership with GE reinforce Nissan's commitment to bring zero emission mobility to the mass market," said Carla Bailo, senior vice president of research and development for Nissan Americas. In one project underway, researchers from the two companies are studying how electric cars like the Leaf can be incorporated into GE's overall concept for a Smart Home, so consumers manage the energy flows in their home and car. Nissan engineers are developing methods to make the car a more integrated part of the home's energy equipment through a two-way power flow between the vehicle and the house. Nissan? Isn't the obvious choice for GE to cooperate with Ford (electric Ford Focus)?